UB students and professors traveled to Albany on Thursday to compete in the New York State Department of Health’s Aging Innovation Challenge. The group presented its prototype for a system that uses 3D-printed objects and smartphone technology to measure the progress of individuals’ rehabilitation. UB was one of five schools to make it to the final round of Thursday’s New York State Department of Health Aging Innovation Challenge in Albany. The competition asked schools throughout the state to create innovative solutions to assist older adults and their caregivers in carrying out activities of daily life. Judges selected the finalists –– Syracuse University, Corning Community College, UB and Cornell University –– from a pool of 24 semi-finalists and 35 original submissions. The DOH partnered with crowdsourcing company HeroX to offer a $50,000 prize pool for the finalists. UB ultimately lost the competition to CCC and Syracuse, which split the competition’s $25,000 grand prize. 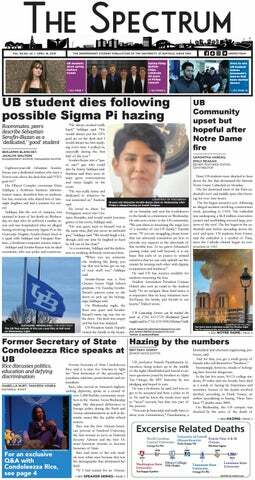 UB received $5,000 for being a finalist. UB’s innovation “mRehab” –– which nine students and professors created –– is a rehabilitation tool pairing 3D-printed household objects and smartphone technology, allowing people with sensory motor deficits to participate in daily rehabilitation more effectively. Users imitate daily activities with the 3D-printed objects –– like taking a cup out of the cupboard or pouring a cup of coffee –– with a smartphone attached to the objects. The phone then measures the user’s range of motion and progress as they complete the activities daily. The $400,000 initiative began in 2014 under Dr. Jeanne Langan, an assistant professor of physical therapy. 10 participants have used the rehabilitation prototype device so far, and Langan said the group plans on furthering the device to impact the local community. The group plans on seeking more funding to continue research on the prototype. Members said they hope to work with more individuals going through rehabilitation to test its effectiveness. The group will also be participating in UB’s Aging Innovation Challenge in February.